Cecil Castellucci dabbled a little bit with science fiction in First Day on Earth but dives right into it with Tin Star. 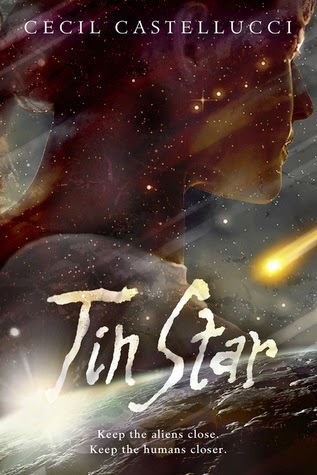 I read Tin Star back in July but the summer swallowed me and I am just now writing my review (the first of 14 I have to do!). Tula's family is traveling on a colony ship headed to a planet on the other side of the galaxy when it makes a pit stop at an out of the way space station. While on the station Tula asks the charismatic but controlling leader of the colony ship one too many questions and Brother Blue responds by savagely beating her and leaving her to die. She is rescued by the ship's Security Chief but not before the colony ship takes off. Tula has no choice but to adjust to life on the Yertina Feray with the help of the alien Heckleck. The book's setting and characters make this science fiction, but ultimately the story could happen anywhere. Tula is beaten and left for dead, has no family or friends to help her, and must survive a cruel world. She is the only human on the station--the ultimate fish out of water story--but soon learns how to fit in with the underground society. This was not my favorite science fiction story or my favorite Cecil Castellucci book. The story seemed to move a little slow at times but overall I liked Tula and I wanted to see how the story would end. I didn't love it but I didn't dislike it either. There is a sequel called Stone in the Sky coming out in February.